This is another review that I've been holding on to for a little while - since we were in Bristol earlier in the year. We visited in the latter part of our holiday, in between our visits to Rosemarino. 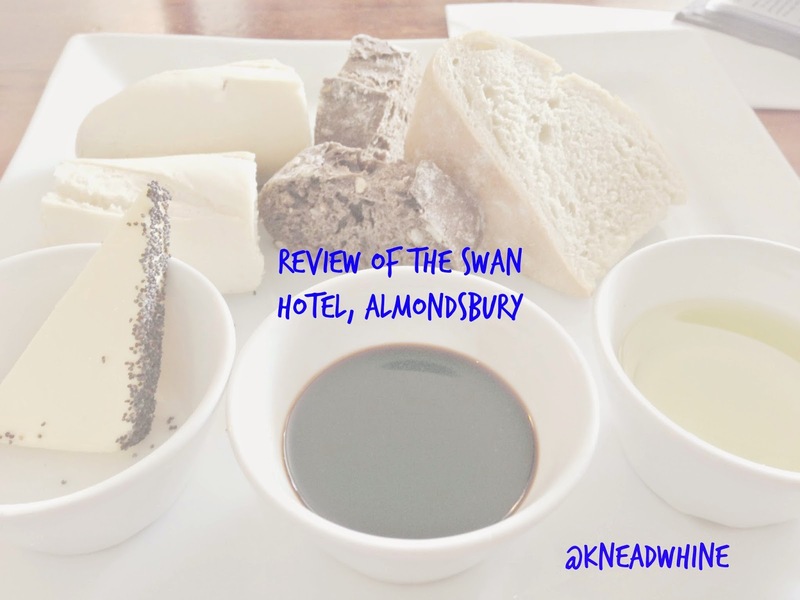 The Swan Hotel was another winner at the Bristol Good Food Awards - winning best family friendly, so when I found I was really in need of a good Sunday lunch, this was where we had to head. The arrival at the Swan Hotel didn't really fill me with much enthusiasm. The exterior looks a little run down and I wasn't sure what we were letting ourselves in for. I know that basing your feelings on a slightly odd car park and a car with broken windows might not be the best way to go forward but I wasn't sure. There is a play area here that was well attended by children though and they looked like they were enjoying themselves. Between this and the fact that we were desperately hungry, we decided to ignore the aesthetics and give it a go. I should mention that the interior is far more pleasing. The decor is modern but not welcoming and although it is sometimes a little difficult to navigate around some of the tables, you don't feel like you are crammed in as many tables as possible. Sometimes we are really in need of somewhere that welcomes families. D liked that there was a variety of games available (although if I were a little picky a lot of them were aimed at an older audience than him - perhaps an Orchard Toy game would help!). I liked that there were proper choices for D. There are several of the old favourites on the kids menu, including tomato pasta, burgers and sausages but these are all made with the same high quality ingredients that you'd find in the adult ones... and they aren't the only choices. The Swan also offers smaller portions of much of the adult menu for children. If you've only stumbled across this post looking for information about the restaurant, you may not know how important bread is to me - although the name of the blog is possibly a clue. So we had to go for the breadboard to start. We were all ragingly hungry, particularly me at 8 months pregnant at the time. This felt like a good way to get something to eat quickly while we waited for our mains. At £3.95 it seemed pretty good value, including some rather piquant balsamic vinegar and the well presented butter. I really liked that as a little touch. I did feel that there could have been a bit more bread available given the amount of oil, vinegar and butter on offer. The rye (?) bread in the middle was a definite highlight though. We did contemplate getting another portion as it was all so very tasty. We needn't have worried though - shortly after our mains arrived. This is something that I really appreciate - if you are serving a Sunday roast then you should be able to turn it out fairly quickly - you expect that the majority of your patrons will order the roast and so having it ready or nearly ready and turning it out fairly quickly seems like a wise idea. 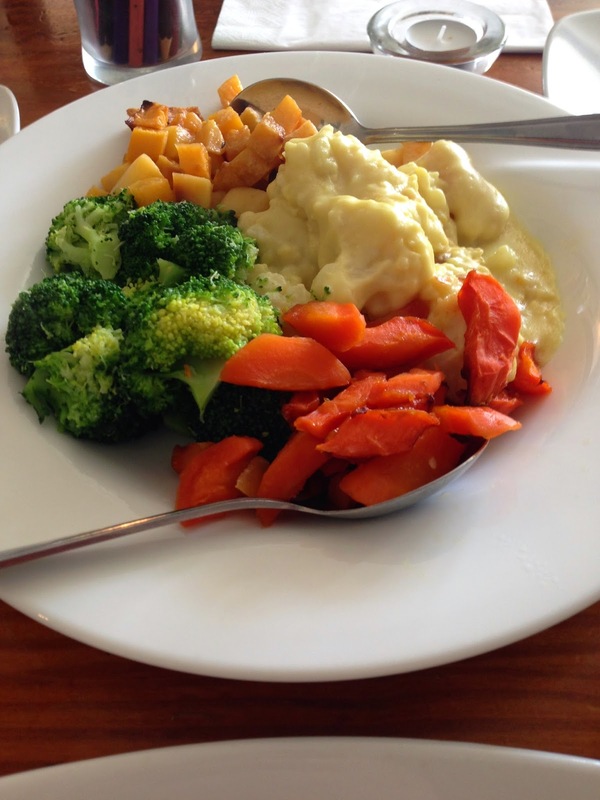 Both D and Mr K had a meat based roast and we were delivered this fantastic plate of vegetables to accompany it. Anywhere that includes cauliflower cheese is alright in my book and this was really well done. Just the right level of cheese in a smooth sauce. For my main, I went for the lentil roast. An unusual one in that it wasn't a coherent shape - just a bit of a splurge on the plate. It was fairly tasty but not the most exciting vegetarian alternative I've had. The large yorkshire pudding was a definite bonus. It's also nice to have really good crunchy roast potatoes - sometimes you don't get that as a vegetarian. It also won a big tick for the gravy. I've commented in the past to friends and family that I am considering keeping some veggie gravy granules on me and asking for hot water to make my own. I really wish we were able to have a go at desserts. There was a good array. I was particularly impressed with the wide range of ice-cream flavours available. We were really impressed with the Swan. The service was really good - very kind and friendly with D and also ensuring that our meals reached us hot. When D and Mr K were away from the table, they took the food back to the hot plate to ensure that it all arrived in best condition. They were attentive with regards to drinks too without being pushy. The Swan offer a loyalty card. I wish we were able to go more often to make better use of it. We are hoping that at some stage we'll be able to take Mr K's mum and maybe his brother's family too - we know we'd be well treated.